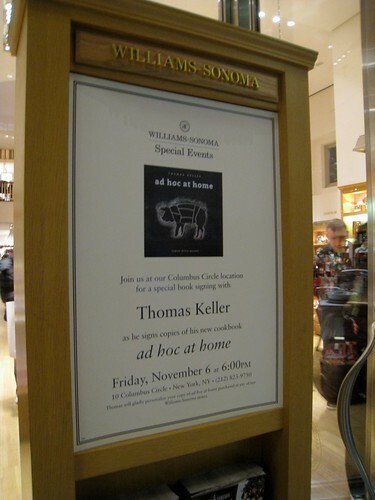 Early November 2009, Michael Ruhlman (@ruhlman) informed me during my daily morning Twitter perusal that Chef Thomas Keller would be signing his latest book, ad hoc at home, at the Williams-Sonoma at the Short Hills Mall and at the Time Warner Center (TWC). The signing at the Short Hills Mall in North Jersey was at noon, so that was a no-go, and Erin, who still attends university near there, was already in the city for the Yankee Parade. EGADS! But then I saw a glimmer of hope—the TWC signing at 6 PM that very night, and luckily, I anticipated on being able to leave work early because of the Yankee Parade madness by my office building, which gave me ample time to get uptown to Columbus Circle by 5:30 PM. I was contemplating all morning whether I should even attend altogether. I had a ticking clock to worry about, as I had reservations that night with Lisa at 7 PM. Obviously, I know where my heart stood with what to do. By the point I started to pack up to leave, all I was thinking about was what I would say to Chef Keller once I was graced by his very presence. I don't know what it is about lines, but for some inexplicable reason, I like standing in them. I'm really into going to book signings, readings, lectures, etc., and most of the time, I have to stand in a line (please see here and here for Flickr pages evidencing such tendencies). I love Shake Shack, too. But when you love Shake Shack, you have to like standing in line! You’d think a "professional beeliner" like myself would know better by now than to dilly-dally and get there ONLY a half hour early. 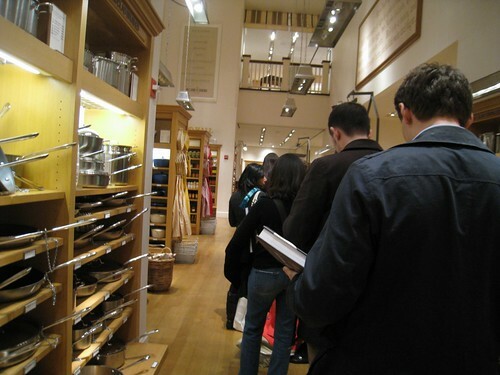 There was a line going around the circumference of the WS store (see below). But before I could stand in line, the friendly sales associates at WS informed me that I needed to purchase the books before I could wait in line. So I thought about how many books I should buy. One for myself, of course. I thought about my cousin, Bill, who told me about ad hoc. He’s a big foodie like me, and he just recently got married at the time and had moved to San Francisco to be with his wife, Pam. He had told me that Chef Keller had created ad hoc as a temporary concept, as ad hoc literally means "for this purpose," while he contemplated what he ultimately wanted to do with the space. He and Pam had been there before and shared with me that it was very casual, offering a 4-course family-style menu that changed daily. I knew they would appreciate the book (signed by Chef Keller himself, of course!) as an early birthday gift for Bill, making my current count a total of two books. I also knew I was going to be late for my dinner plans with Lisa (another fellow foodie! ), so I grabbed a third copy for her. We wax poetic about Chef Keller all the time and how we would totally drop everything and impulsively fly to Yountville for a chance to sit and dine at The French Laundry. I knew this would be my "get-out-of-jail-free" card for being so late to dinner, for sure. While I was waiting in line, I met a woman in line (my really good friend, Linda, now! ), and we started talking about all the cool things foodies talk about (or at least I'd like to think they're cool, haha)--chefs, restaurants, past experiences, cooking, cooking classes, books we've read. It turns out we are crazy about the same things in the food world, and it totally made the wait in line go by so much faster! They also passed out samples of a couple recipes they prepared using ad hoc at home--very typical at a Williams-Sonoma cookbook signing--including a cauliflower soup (delicious--contemplating preparing this for Thanksgiving this year!) and another dessert dish (blanking at the moment). 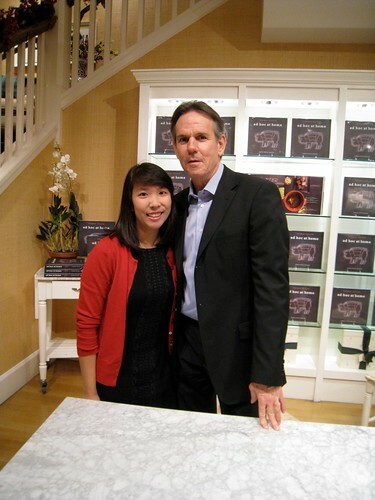 Forty-five minutes later, we both got to meet Thomas Keller! Me with Thomas Keller, after he signed by copy of ad hoc at home! 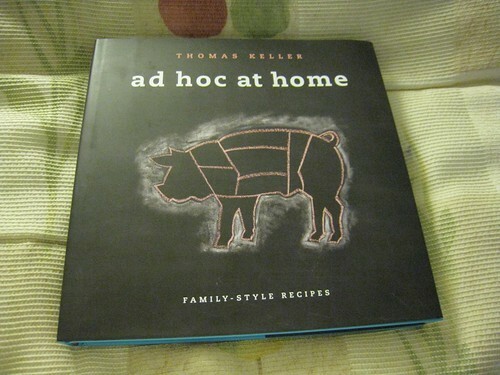 My copy of ad hoc at home. 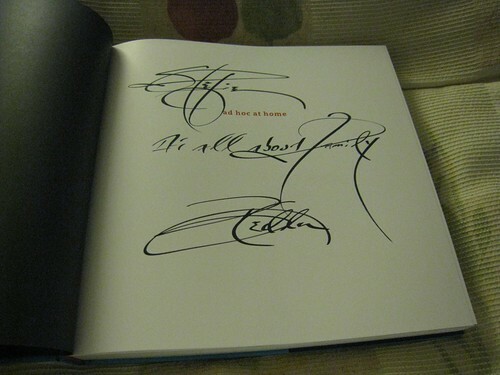 The signed and personalized title page by Chef Keller, in calligraphy, with the message, "It's all about family!" Chef Keller: Hello. *looks at pre-written Post-It written by WS sales associates*Are you, Stefie? Stefie: Yes, I am. *looks at his calligraphy pens* I've always wanted to learn how to do calligraphy. I've tried it so many times but failed miserably each time. As you can probably gather, I almost fainted. Thomas Keller winked at me! As Linda likes to put it, these people (i.e., chefs, restaurateurs, and the like) are like rock stars to us, so we're going to act accordingly. Couldn't've put it better myself! Findings: So not only did I leave the store with three VERY heavy (5.4 pounds each, according to Amazon.com--see link below) cookbooks, signed, and personalized by Chef. Keller himself, I also left with a new friend (yay for new friendships, Linda)! So crazy how you meet people sometimes--it always happens in the most unexpected of places for me! Price point: $50 for each copy.